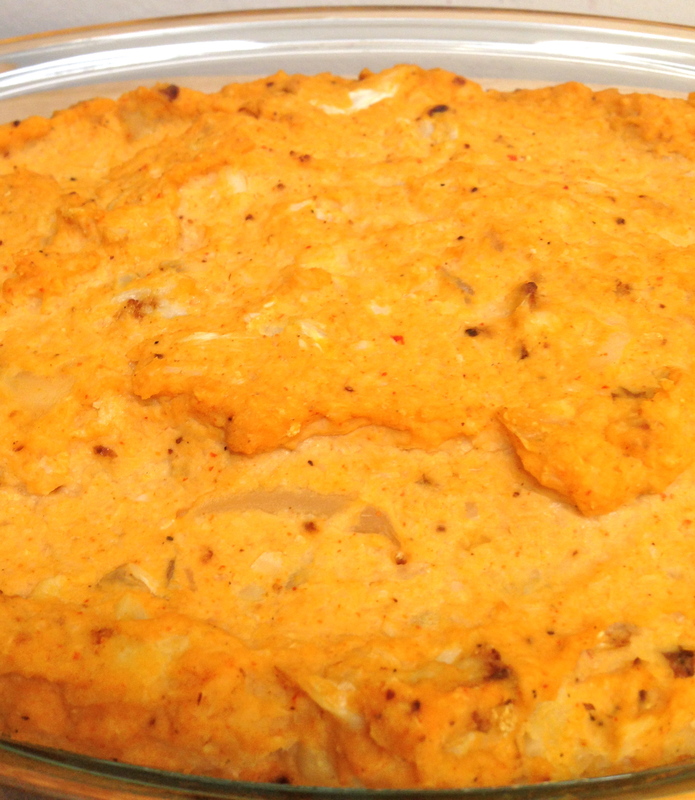 This Spicy Dip Has A Hot Secret: Cauliflower! I was inspired to make this after seeing so many amazing looking recipes for similar dips, but so many of them were laden with cream and calories. 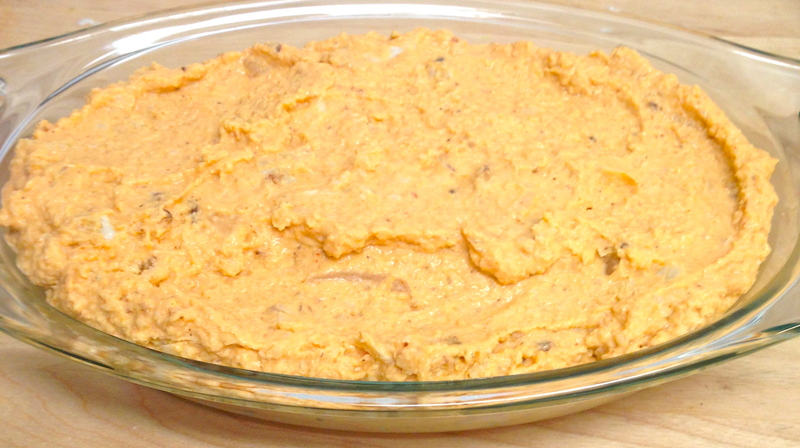 This spicy, hearty-tasting dip only feels like a treat! It packs in a heaping portion of cruciferous standout, cauliflower, along with its fiber, vitamins C, K and and many B-complex vitamins! And for 100 calories and only 4 g fat per serving, you can get your buffalo wing fix without all the extra calories and fat. Serve with veggies, pita, bread, crackers or chips, or eat it on its own! Got a little messy – I used my immersion blender! 1. Preheat oven to 415 degrees Fahrenheit. 2. Lay cauliflower, onions and garlic on baking sheet sprayed with nonstick vegetable oil spray. Drizzle oil over vegetables and roast for 20-25 minutes, until soft and slightly browned. 3. 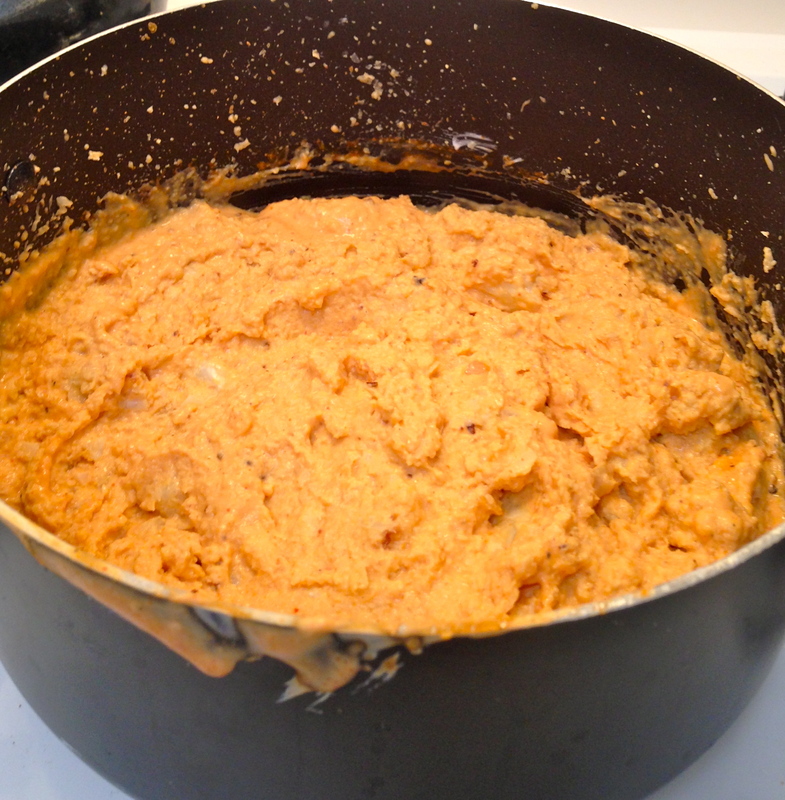 While vegetables are roasting, blend all other ingredients together (Greek yogurt, flour, beans, hot sauce, spices). 4. Once vegetables are roasted, add to blender. Blend or pulse for a few seconds, keeping chunks of cauliflower visible. Bake in oven 20-30 minutes at 375 degrees Fahrenheit, until dip is warm and set. Serve with veggies, pita or chips and enjoy! *This dip stays really well in the fridge and is amazing cold as leftovers (or warmed up for a few seconds in the microwave). I like to keep it around as an alternative to hummus and pack it for lunch! Star-Worthy Oscar Party Treats, Slimmed Down! Thanks! Hope you like it! It is one of my favorites!